The reason I share this brief anecdote with you is not to judge their knowledge of the internet – but to display how there are real people out in the community who are directly impacted by the information/digital divide. In addition, I am guessing that many of them have not stepped into a library for years. This of course, got me thinking: here libraries are, public institutions, some who have Chilton’s – a mechanics dream – and the digital divide is separating them from accessing this great resource … or else maybe another way of looking at this story is…. maybe since we have not stepped outside of the library and talked with middle aged mechanics, we have not heard about their needs. Maybe Chilton’s is important to them, but maybe mapping programs, online movies etc. are just as important. How many of these opportunities are we missing? Maybe we need to have an honest discussion around how we engage with our communities? This is just one example of possibly hundreds or even thousands of opportunities that libraries are currently missing out on. How can we start discovering the needs from our local communities? Would engaging them in different ways be a path to doing this? I am guessing that if I asked most library staff if they engage with community – they would answer correctly – of course they do! So the question really is, how do we engage with communities? How do we define engagement.. and how are we pushing ourselves as library staff to try out new engagement techniques (building upon our current strengths) to try new ways of engaging with community. when we approach people to discover their information questions (e.g. the reference interview). Now of course this is not an exhaustive list, but you get the point. Now, I am going to push a little bit here – how are we engaging community during programming, how are we engaging people when having informal conversations, or more formal information questions? And how is this information gathered and used to create relevant services and programs? When looking at the Community Led Toolkit (page 16) there is a great chart which displays the different levels found within the Public Involvement Continuum. (Click on the picture below to get a bigger view of the continuum)! Here is a great exercise to walk staff through (whatever the business/branch/program unit is). Have staff identity the four public service activities which takes up a majority of their time. On a large sheet of paper display the continuum on a wall – just the main sections (getting, giving, engaging, collaborating) – and have staff put up their four current work activities and see where they fall on the continuum. I am guessing most of the responses will be loaded to the left of the continuum – we are primarily engaging community through getting and giving information. The question then becomes, how can we envision engagement differently? How can we push engagement so it becomes a more dynamic, two way process? What are the possibilities? gather what they are hearing from people who are in the library space (this could include all staff regardless of job classifications)? sit in on informal group meetings taking place in the library (or outside the library) – don’t promote library materials or services – instead form relationships and listen to needs as they arise from the group? 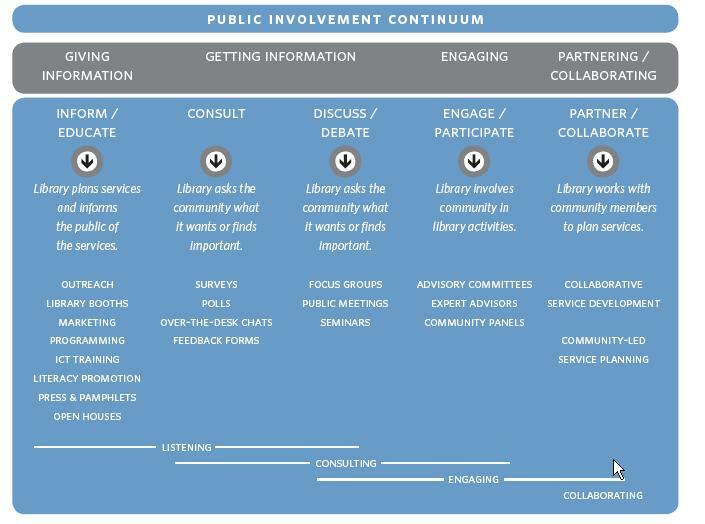 Just think of the impact of the information brought back to other library staff – to discuss the potential impact of the community conversations we were involved in – on library based programs and services. Will it be possible for us to expand the role of library services to broaden our horizons to include discussion/debates (focus groups/public meetings), participate (community based advisers/ad hoc committees – just imaging having community members sitting on one of our internal committees! ), or collaboration? It would be a real shame if we only allow engagement to be constricted to information out and places where we seek feedback from the community (consultation). As a side note, by pushing engagement to the right of the Public Involvement Continuum, we will find that we will empower not only our communities, but our staff.